Way back in the day, my father wore Armani Eau Pour Homme as his signature fragrance. This butch smell of golden citrus fruits, dry herbs, lavender and moss, formed my understanding of what ‘men’ should smell like and has had a great influence on the style of masculine fragrances that I wear today (I pretty much love anything that is remotely fougére-like). Eau Pour Homme was launched in 1984 (and subsequently relaunched in 2013) and was penned by perfumer Roger Pellegrino (the man also responsible for Anaïs Anaïs by Cacharel). It is very much a relic of its era and smells very much of its time, so it’s no surprise that Armani have updated the line with a number of flankers that reinterpret the spirit of the original into a more modern setting. 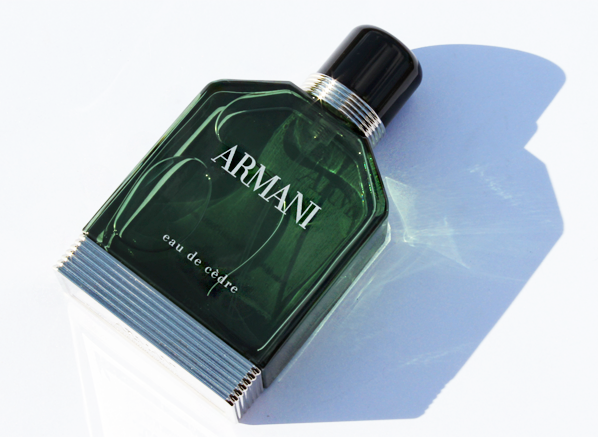 The latest remixing of Armani Eau Pour Homme is seen in Armani Eau de Cèdre, a flanker that was inspired by the elegant, soft and delicate nature of a gentleman’s velvet jacket. 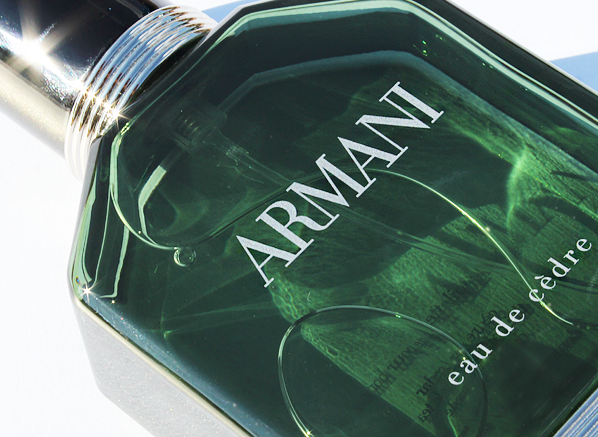 The bottle is shaded in emerald green and the fragrance centres around the popular note of cedar wood. Cedar wood is a typically dry wood that has an odour profile ranging from the smell of fresh pencil shavings (evoking brand new pencil cases at the beginning of the school term) to something more sharp and spicy. What is intriguing about its use in the Armani is how subtle and soft it appears, as it is weaved into a calm and modern composition. Eau de Cèdre opens softly with a delicate breeze of citrus notes. Rather than bubbling excitedly in brightly coloured tones of lemon and bergamot, the top notes here are most definitely muted, presenting pastel-shaded citrus notes with the shimmer, and glean removed. This results in a calm and smooth opening accord that is relaxed and soft, which is very much in keeping with the general mood of the fragrance, and its fabric inspiration. Underneath the citrus is a cool bed of watery violet leaf, which adds a little bit of transparency to the pastel-shaded bergamot and lemon, extending their dewy and fresh tones. The heart and base follow a slow transition between pale greenery and warm, musky woods. There’s a subtle hint of something banana-like in the heart, perhaps a by-product of the blend of violet leaf and spices, which lends itself nicely as the link to the musky base of velvety green tea and cedar wood. Here, the cedar is all texture and no spice. There are no pencil shavings to be found here, and instead the note comes across as if it has been sanded down into a perfectly smooth sphere, allowing its warm, woody tones to be wrapped in the powdery greenery of the tea and plush covering of the suede. Armani Eau de Cèdre feels far removed from the robust and hairy-chested masculinity of Eau Pour Homme, in fact, one could be mistaken for assuming it is a feminine fragrance when directly compared to the original. The two fragrances are as different as the men of 1984 and 2015. Where the original is butch, un-pampered and rugged, Eau de Cèdre is well-groomed, sensitive and smooth. As far as everyday scents go though, this new interpretation strikes me as something perfect for the man who is not looking to make too much of a statement with his fragrance choice, and instead wishes to smell good whilst remaining relatively incognito. In that respect, Eau de Cèdre works very well and the quality of its composition, and ingredients, lead it to be a sensible choice for a casual scent for the modern man. This entry was posted on Wednesday, October 14th, 2015 at 4:37 pm and is filed under Candy Perfume Boy, Fragrance, Men, Tried & Tested. You can follow any responses to this entry through the RSS 2.0 feed. You can skip to the end and leave a response. Pinging is currently not allowed.